Police Chief Will Johnson fired a 49-year-old rookie officer Tuesday, saying his poor judgment and communication failures endangered his fellow officers and led to a “catastrophic outcome” — the death of a 19-year-old burglary suspect. 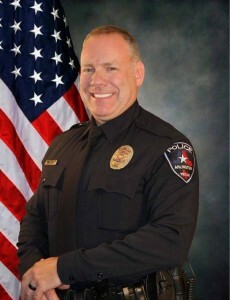 Brad Miller, the Arlington police officer, fatally shot Christian Taylor, an Angelo State University football player, inside a car dealership last week. At a news conference unusual for its detail, Johnson said he has “serious concerns” about Miller’s decision to use deadly force in confronting the man inside the business. Johnson said it was his responsibility to take administrative action, which he did by firing Miller. “We recognize the importance of these topics,” Johnson said. Taylor was killed early Friday as officers responded to a burglary call at the Classic Buick GMC dealership on the Interstate 20 service road east of Collins Street. Taylor, a 2014 graduate of Mansfield Summit High School, died of gunshots in his neck, chest and abdomen, according to the Tarrant County medical examiner’s office. Security video released by the dealership shows Taylor vandalizing a vehicle in the parking lot. Police have said that he later crashed a Jeep Cherokee through the glass front of the showroom. Initially, six officers in five patrol cars responded to a 911 call of a burglary in progress about 1 a.m.
Two of the officers were Miller and his training officer, Cpl. Dale Wiggins. Wiggins and Miller went to secure the west side of the building as other officers established a perimeter around the structure where Taylor was spotted, Johnson said. But Miller failed to communicate with other officers, including his field training officer, about his intention to enter the building in pursuit of the burglar, Johnson said. Miller also failed to formulate an arrest plan with his supervisor and his fellow officers and failed to wait for other officers to assist in apprehending the burglar, Johnson said. According to police policy, an example of an arrest plan would be to designate three officers and assign them different tasks, Johnson said. One officer would provide cover fire if needed, while another would be assigned Taser duty to subdue the suspect in case he became noncompliant or combative. The third officer would place the suspect in handcuffs. None of those discussions took place because Miller rushed ahead without a plan, Johnson said. Miller told investigators that after he entered the building, Taylor approached him screaming. Miller and other officers saw a bulge in his shorts, which Miller thought was a weapon, Johnson said. Wiggins told investigators that he heard a “pop” that he believed was a Taser being discharged. It was actually Miller firing his service weapon, Johnson said. In response, Wiggins deployed his Taser, and after that, Miller fired his gun three more times. There was no physical contact between Taylor and the two officers, Johnson said. The bulge in Taylor’s pocket was found to be a wallet and a cellphone, Johnson said. Taylor came within 7 to 10 feet of Miller and Wiggins, Johnson said.